After a diverse week working with teachers in a variety of contexts I feel like I need to de-brief, to take stock of the work and the experiences and what better way than to blog about it ! 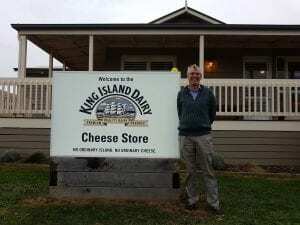 Arriving on King Island on Sunday afternoon to meet my colleague Peter Lelong (Tasmanian CSER Project Officer) was a rare opportunity for me to work with teachers in quite a different context to my usual experiences as Victorian Project Officer. It was wonderful to try and understand the workings, blessings and challenges of this isolated rural community. While the weather was not particularly warm, the welcome was. 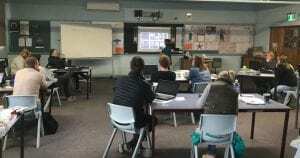 On Monday, we had a great day discussing the relevance of the new Digital Technologies curriculum, working through classroom examples and exploring some tech tools. 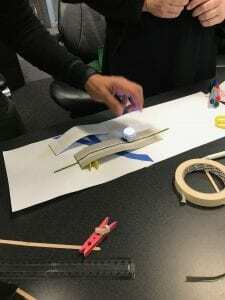 Before leaving on Tuesday, we explored Makey Makey kits with some students as they were going to continue working with the CSER Lending Library Kit for the remainder of the term. 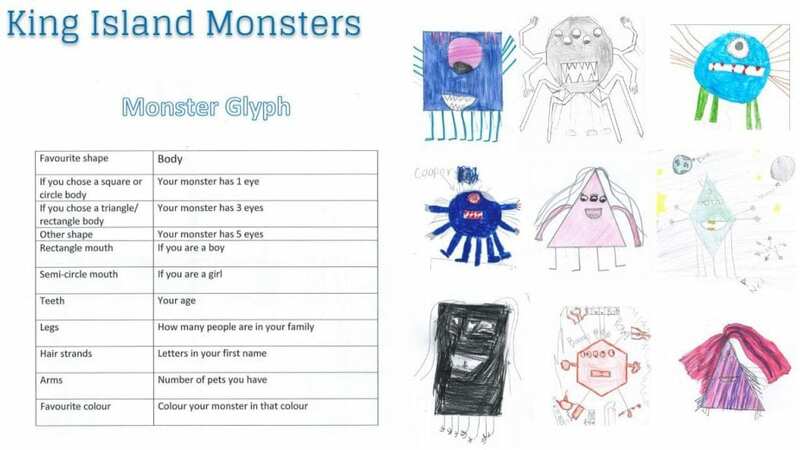 One activity on Monday for the teachers was a ‘data’ activity – Monster Glyphs. It was lovely to see the immediate use of that idea on Tuesday morning adapted by the Year 3/4 class teacher and very much enjoyed by the creative monsters ! 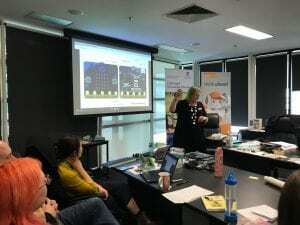 Wednesday saw another wonderful collaboration between CSER and Museum Victoria Education Team – a session hosted by Scienceworks. 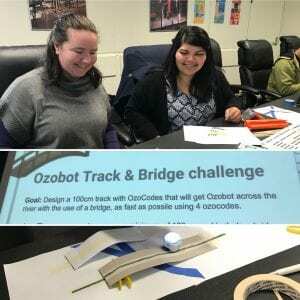 Toni Falusi, our ACT Project Officer led secondary teachers through unplugged activities, Ozobot challenges and Microbits workshops. 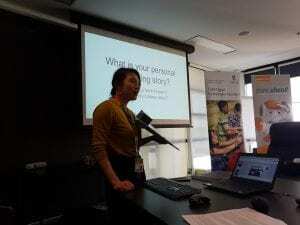 Great stories were shared when the day began with a rich discussion, led by Mei Liu on our personal history with technology. 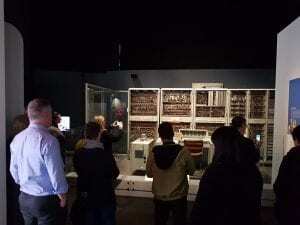 We visited CSIRAC – the fourth computer in the world which was designed and built in Australia in the late 1940’s. This was a wonderful start to our day really highlighting the changes over the decades. Participants were so encouraging and seemed to enjoy being in the role of learners – happily working through challenges and hands on activities. Thursday morning saw Toni and I fronting up to my favourite conference Digicon, DLTV’s annual event. 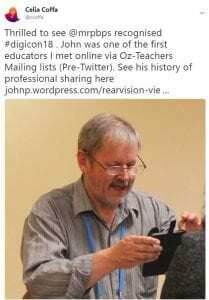 This is always more than a series of learning sessions for me, it is a lovely opportunity to meet many teachers who form my Professional Learning Network face to face. Rafranz Davis in her keynote mentioned the power of being a connected educator and every visit to this conference reminds me of that ! The CSER team expanded again, joined by Sue Carter the NT Project Officer. Toni and I ran a session each day and were once again joined by groups of teachers who were happy to have a go and play with whatever challenge we set. From dice games on flowcharts to creating digital dice with Microbits they were eager to discuss their ideas and contribute. A highlight for our CSER team was to meet and hear from Linda Liukas author of the Hello Ruby series of books. 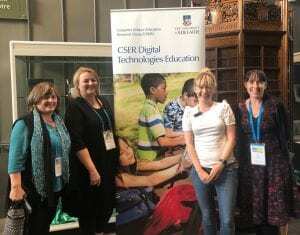 I was also thrilled to be at Digicon when two long time members of my Professional learning Network John and Bec were recognised for their contributions to the community. John received the ISTE Making IT Happen Award and Bec was awarded Outstanding Leader. Steve Allen and Natalie Heath were other well deserved award recipients. 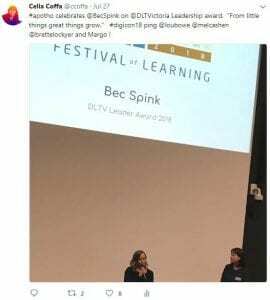 Both Bec and John mentioned that as teachers they are constantly learning from those they work with. 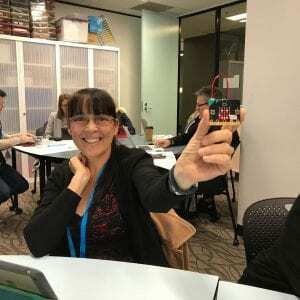 From King Island to Scienceworks to Digicon, the common element was teachers who were not afraid to be learners and who were also happy to share their skills, challenges and experiences. What a week ! My mum was a bit of trailblazer when it came to technology. I didn’t notice or appreciate it at the time, but items came into our house before they arrived in many neighbouring homes. We had a microwave oven, a personal computer, a home darkroom and many photographic items. The computer and camera equipment were used by mum to be both creative and practical. With photography Mum created audio-visuals (the precursor to slideshows and moviemaker) – stories created with images on slides and music. Would her creative juices been connected to digital publishing instead of the beautiful calligraphy she produced? I have evidence of quirky cards made with MS Publisher in it’s earliest forms and I wonder what she could have created with Canva! In her 70’s and 80’s, Mum embraced email using it to keep in touch with many distant friends and family. Word processing developed from being a business tool, a wonderful extension of the typewriter she mastered as a 16 year old to being the tool of choice on which to create poetry, prose and stories. She was quite happy to share what she wrote, shaer her thinking and ideas with others and in those days her work was published in printed newsletters. It was well received and Mum enjoyed the responses she received from her ‘readers’. I can’t help but wonder what Mum would have created with today’s tools at her fingertips. I see her as being a blogger – sharing her writing in a number of ways. Her handwritten travel journals would likely have been blogs. I can see her creating a whole new network of people: commenting on posts, creating conversations with those beyond her local area. I wonder how she would have viewed Facebook. I think she would have loved the fact that it connects people, keeps them in touch over time and space. I am fairly sure, her forehead would wrinkle at some of the inane material people share, but I reckon, she would be there, contributing and receiving in her own way. Digital photography would have allowed more instant products and variations, I am not sure they would be any better but the variations would have been extended. The ability to access information in an instant would have challenged her but I think she would enjoy the ability to answer that niggling question in a few key strokes. No-one can transplant themselves into another generation, we live our lives as we can and as we should, in the environment in which we are born….. but I do wonder. Creativity takes many forms. What would Mum have done with today’s tools? With older students we could have explored the Google Sheet which collected the data to create a variety of graphs. Young children cannot use social media on their own. That does not mean they cannot use it, guided by their teacher as a great way to share their learning and to develop their literacy skills along the way. 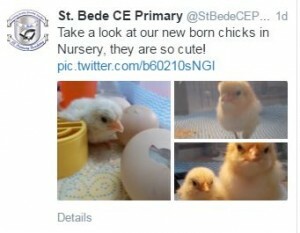 A wonderfully rich experience in junior classrooms is the experience of witnessing chickens hatch and grow. Teachers garner so many opportunities – in viewing and observing, language vocabulary, maths, not to mention the sense of awe watching a living creature grow. Nowadays, that learning does not have to stay inside the classroom and through technology, the experience can be broadened and extended. What would you prefer? Your student completing a written journal of the growth of a chick that is never seen by anyone except the teacher, has no interactions or … the written journal (for the personal task) AND this shared experience with their class ? The students are observing, questioning, reading and writing, just as they would without the technology, but with the added value of a real audience, others involved to share it with and extend their thinking. Questions and affirmations from other stakeholders in their learning – an audience that provides a true purpose to construct replies and articulate their understandings as well as just the fun of sharing the excitement! The journey is recorded in a digital format, available to be shared with families, the rest of the school and used in many other ways. 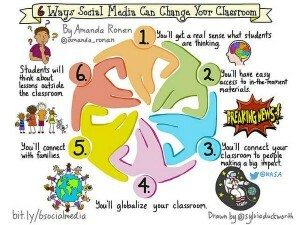 I have had some interesting conversations recently about school’s use of social media. Opinions range from the very hesitant and quite wary to very positive and amazingly enthusiastic. I have read articles about the downturn in interest in Twitter, the swaying audience of other tools. They are good conversations and ones I hope to extend by sharing here. My conversations with teachers usually steer towards the particular tools; Twitter, Facebook, Google+ etc and then a discussion around the purpose behind the activity. The intended consequences are varied but quite easy to define, but it seems that the unintended ones, or the fear of them, are what become the roadblocks to what I have experienced as a wonderful gateway to connections. There are people much better trained in communication strategies than me but what is clear to me, is that whatever the tool we are using, we are talking about communication and in most cases relationship building. The intended audience will in many ways determine the best tool – who are we trying to connect with and for what purpose? are we intending to broadcast news or promote interaction and feedback? In today’s world of immediate access to information and news, some older methods of communicating with our communities are becoming defunct or redundant. A weekly printed newsletter is not enough for most of of our parent communications and it will never connect our students to other stakeholders in their learning in the way online communications can. I maintain and am convinced that if we expose students to the concept and reality of working in a space that is not limited by their physical surroundings, that we are doing them a great service. Our access to information is 24/7 and global and so too should be our learning experiences. 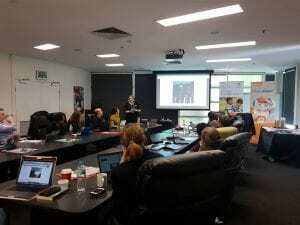 I am very aware that the concept of an online Professional Learning network is entrenched in many people’s lives, but it still does not appear to be the norm and all I can say is that I think that those not involved are missing out. 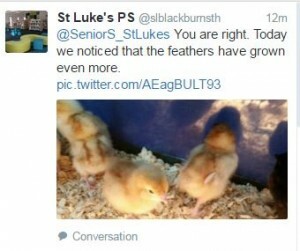 Note: School based Twitter account @slblackburnsth is managed by teachers only as our students are Under 13. The students contribute ideas and text that is published by staff in a modelling process. Thanks again to Sylvia Duckworth for once again synthesising ideas into such a wonderful format and Amanda Ronin. Since writing this, I found this post by Sylvia Rosenthal Tolisano which encapsulates this topic much better than mine.